I guess I’m like Roger Miller who used to say that he didn’t have as many jokes as he thought he did. Glen Travis Campbell was born in Delight, Arkansas, USA. He is an American rock and country music singer, guitarist, songwriter, television host, and actor. 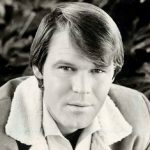 He is best known for hosting a music and comedy variety show called The Glen Campbell Goodtime Hour on CBS television from January 1969 through June 1972. During his 50 years in show business, he has released more than 70 albums. He has sold 45 million records and accumulated 12 RIAA Gold albums, four Platinum albums and one Double-platinum album. He made history in 1967 by winning four Grammys total, in the country and pop categories. His albums list shown below: Big Bluegrass Special, Gentle on My Mind, Burning Bridges, A New Place in the Sun, Galveston, I Remember Hank Williams, I Knew Jesus, Rhinestone Cowboy, Southern Nights, Highwayman, It's the World Gone Crazy, Letter to Home, Favorite Hymns, No More Night, Walkin' in the Sun, Wings of Victory, Somebody Like That, and Ghost on the Canvas. His role in several films include: Baby the Rain Must Fall, The Cool Ones, True Grit, Norwood, and Uphill All the Way.